Added August 2009: Refusing to deal with the Complaint discussed below, the judge ordered that a new complaint must be filed before the lawsuit could proceed. Click here for the ICR’s second amended complaint. This is a remarkable lawsuit in many respects. Everyone expected that ICR would challenge the outcome in federal court, after exhausting their state administrative remedies. I was wondering if they would sue to get their program accredited, or sue to have their program exempted from the need for accreditation. Remarkably, they have sued for both, and without first exhausting their administrative remedies. ICR is arguing that the state has no power to grant or withhold accreditation from a private religious school that is not receiving public money, and, at the same time, that the state should be compelled by the federal court to grant such accreditation (!). Note the strenuously sophistic effort to present this as a civil rights case, and the invocation of Ben Stein‘s movie Expelled, and the ACSI lawsuit against the University of California. Complete court documents are linked from Steven Schafersman’s excellent overview of the lawsuit & related developments, with links to a rich body of background and discussion of this matter. James J.S. Johnson is a lawyer, part time state agency trial judge, adjunct professor for LeTourneau University in Texas and a cruise-ship lecturer. On the University of California case referred to in the complaint paragraph featured above: NCSE has posted an update on the appeal of that case, with a link to their page of case documents. 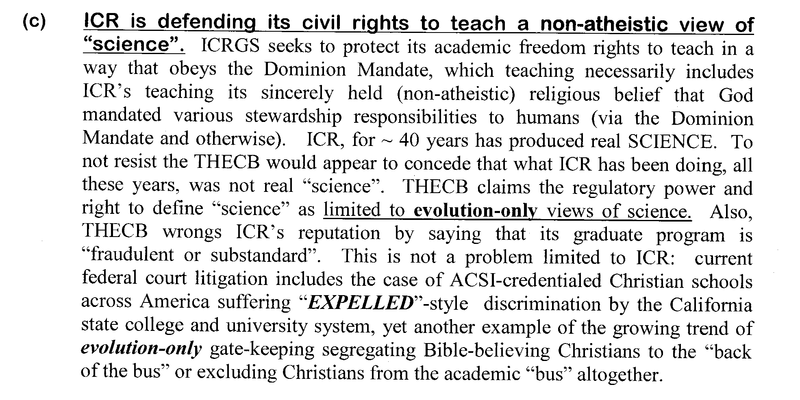 For earlier posts here on the ICR accreditation issue, see https://curricublog.wordpress.com/category/creationism/icr/ . This entry was written by Tony Whitson and posted on April 21, 2009 at 3:54 pm and filed under blog, Constitutional law, creationism, Education, Education Law & Policy, Evolution, Expelled, ICR, Intellectual and Academic Freedom, jaw, Politics of Education, Professional Education, Religion, Science, Teacher Education, Texas. Bookmark the permalink. Follow any comments here with the RSS feed for this post. Post a comment or leave a trackback: Trackback URL. I wonder what the difference is between SCIENCE and “science”. ICR apparently does both. Do they also do “SCIENCE”? The Roman “science” of the day probably would have been called “philosophia” or something like that by a contemporary. Reserving the word “science” solely for knowledge of the natural world didn’t become a convention until the 19th century. I don’t understand, are you saying that they are unqualified because they teach Creationism? other simply may not be high enough in quality to be used.